21st June – International Yoga day is less than a week away. On that day Malls, parks, schools, play grounds, office meeting rooms – will be packed with enthusiastic people twisting their bodies and stretching themselves to do 108 Surya Namaskars. To the layman Yoga is primarily associated with “Asanas” and to a lesser extent “Pranayamas” that help you on the physical front – improve flexibility, enhance your energy, cure ailments and make you feel fresh and rejuvenated.Its wonderful that Yoga is becoming so popular globally. However there is a lot more to Yoga than this. Lets take some time to reflect on “What is Yoga”? Are we doing Yoga in totality or are we doing only 1/8th of what Patanjali documented in the Yoga Sutra’s. My motivation to write this Blog came after I watched a wonderful talk by Sri M on Ashtanga Yoga. This article is a summary of that Video. I am attaching the link below – do watch the 1hr video. The way Sir explains it with witty stories and anecdotes is a treat to watch. The Yoga Sutra – widely regarded as the authoritative text on yoga, is a collection of aphorisms, outlining the eight limbs of yoga. These “threads” (as sutra translates from Sanskrit) of wisdom offer guidelines for living a meaningful and purposeful life, and the steps to merge your limited identity with the Ultimate. The Yoga Sutras are considered the most accomplished and well compiled step by step writings on Yoga – but it is not the only one. Even the Bhagwad Gita is a book of Yoga with the 18 Chapters each showing a step or path towards enlightenment. The Yoga Sutras were compiled by the great sage Patanjali. He is depicted as half man – half snake and is said to have consecrated the famous Shiva temple at Chidambaram. When we visited Tiruchi we were pleasantly surprised to see the Jeeva Samadhi of this great sage in a small temple in the suburbs of Tiruchi – the Brahmapureeswarar temple. The basic aim of Yoga is to settle the mind down. As Patanjali explains in the 1st chapter the goal of Yoga is ” Chitta – Vritti – Nirodha“. The agitated mind needs to be calmed – and Sir explains it well by saying that this is the tarmac from where you can start the journey. 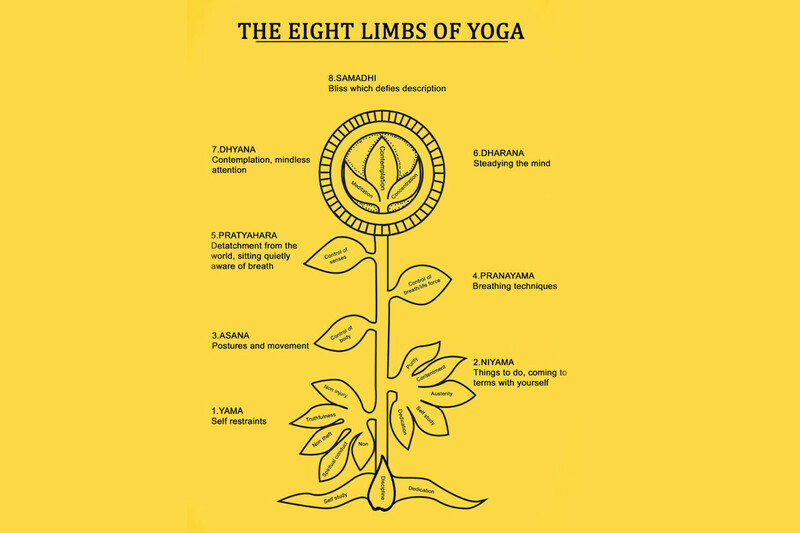 Like Gautama’s Nobel 8 Fold Path – Patanjali has clearly defined the 8 Steps to follow in Yoga – hence the name Ashtanga Yoga. Many practitioners in the US may credit B.K.S.Iyengar as the founder of Ashtanga Yoga – but he was just a passionate student and teacher of Ashtanga Yoga spreading it in the west. The 8 Limbs of Ashtanga Yoga are Yama, Niyama, Asana, Pranayama, Pratyahara, Dharana, Dhyana and finally all of this leading to Samadhi. Please go thru Sri M’s talk for a thorough understanding of these steps – I am sharing a quick summary basis my recap from the talk. Yama & Niyama’s are the rules and regulation to be followed. Predominant amongst which is simple living. Moderation is the key. The ability to be compassionate and not harm others – Ahimsa in action, words & thought. Following the path of Brahmacharya – which is not necessarily celibacy but having self control. Asanas – the step that is most associated with Yoga, helps the practitioner to a strong snd supple body. A healthy body is a must for the long and arduous journey of a spiritual seeker. If the body is still the mind is still. An Asana is a posture in which you can sit comfortable for an extended period of time. There are over 108 Asanas that help energise all parts of the body – many of the focused on the spine. Asanas also play an important role in activating your ductless gland (Endocrinal Glands). Which is the reason your Yoga Teacher asks you to hold that pose for 6 – 7 breaths so that the effect reaches the glands thru the muscles. Asanas when done correctly move the limbs from a position of being tense & stretched to relaxed. This helps in flow of energy or “Prana” the life force thereby balancing the body & mind. Pratyahara is the capacity of a person practising Yoga to be able to switch your mind on and off and focus full attention on what you are doing. This is a skill that can be learnt with time. It is a crucial skill and is the core teachings of even the Zen school. Dharana & Samadhi – After you have accomplished Pratyahara you use this skill to FIX your mind with single-minded focus on 1 sound , 1 image , 1 thought and exclude everything else. When you stay in this state for an extended period you slowly dissolve and there is no difference between the meditator and the surrounding – you melt and become one with the universe and that is the ultimate state of Samadhi. You become empty and the divine energy from the universe flows thru you. This is the ultimate goal of Yoga. The article is based on the talk by Sri M on Ashtanga Yoga in March 2018. Please do watch the video – the talk on Yoga is for 60 Minutes.